Taping details along the neckline and down the center back. Black, Indigo, Royal, Steel, and Wine all have self taping, Cashmere Rose and Misty Lilac have Steel taping, and Pale Sky and Surf Aqua have Black taping. 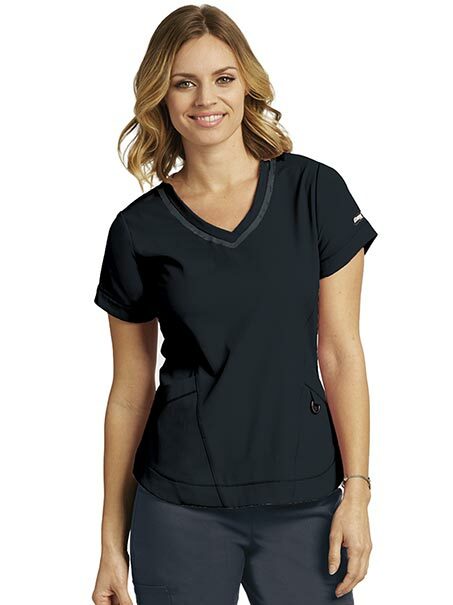 Performance stretch fabric that has moisture-wicking and soil release properties. The fabric content is 74/23/3 poly/rayon/spandex twill.